Through opportunities for food production and through the provision of crafts materials, medicinal plants and sedges for thatching, wetland can help contribute to poverty reduction. 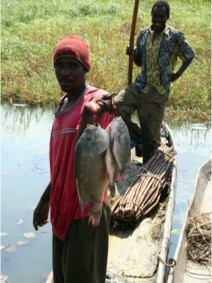 In particular, many low cost and useful products can be made from wetland materials – such as sleeping mats, while wild plants and fish collected from wetlands can provide relish. For some households wetland can be a source of capital – from their market-oriented vegetable growing, for instance, and this can allow new enterprises to be developed – such as chicken rearing.